Details about the ANIMALS! 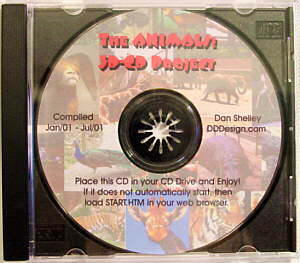 3D-CD Project. Have you been looking for some great 3D pictures for your kids (or you) to look at since you got new 3D glasses when you saw the recent Spy Kids 3D movie? 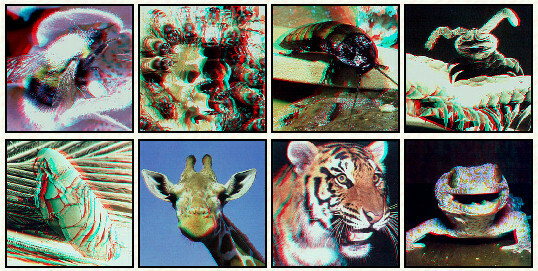 How about a 3D-CD that contains about 500 modern and antique stereo images of various members of the animal kingdom including bugs, fish, bears, giraffes, lions, elephants, snakes, frogs, gators, birds, dinosaurs, and SO MUCH MORE! Well, this is what you have been looking for. You and/or your kids will get hours and hours of enjoyment out of this! - The ANIMALS! 3D-CD. It is Windows, MAC & UNIX compatible - it only requires a web browser on a computer to be enjoyed. These are presented as both stereo pairs and anaglyphs, and good quality lorgnette and anaglyph glasses (in case you don't still have yours!) are included. There are image submissions from a variety of modern stereo photographers. The images presented in this auction are just a few scattered samples, and are just small versions of the larger files on the 3D-CD. Imagine all the fun your can have printing these out to decorate a room, or share with friends at school or work! This would make a fantastic Birthday (or any other occasion) present! Extra anaglyph 3D glasses can easily be optained when you get your copy.